Looking further back, however, the story of sub-Saharan comics in the first half of the 20th century -- during the colonial era -- seems a sparse and rather dreary affair. Published histories present the same few examples of newspaper strips and magazine panels that almost always reflect the racist, paternalistic attitudes of the colonialist or missionary publications in which they originally appeared3. These comics were, for the most part, created by non-Africans, and their graphic style derived entirely from European models. And then there’s Ibrahim Njoya. Born around 18874 in the Bamum kingdom of western Cameroon, Njoya was one of the earliest African artists to work in the medium of drawing on paper. From the 1920s through the 1950s, he drew scenes from the history and daily life of Bamum culture, often using juxtaposed images, sequential narratives, elaborately patterned framing, and innovative relations between drawn image and calligraphic text. If we seek a different way to consider the early history of African comics, the work of this extraordinary artist is a good place to start. The art of Ibrahim Njoya offers a window into the time and place in which he lived and worked. His career is inextricably linked to the reign of his homonymous older cousin, patron and collaborator, the visionary ruler Sultan Ibrahim Njoya. It’s worth looking at this fascinating and complex period in some depth. For clarity’s sake, while dealing with the historical background, I will refer to them as Sultan Njoya, and, for the artist, simply Ibrahim. The Bamum kingdom was probably founded in the late 16th or early 17th century, by migrants from the nearby Tikar region. After a period of dramatic military expansion in the early 19th Century, the kingdom occupied about 3000 square miles, with a population of 70,0007, the largest state in what is known as the “Grasslands” region of western Cameroon. Its capital Foumban became a thriving center for the arts, with artisans brought in from neighboring peoples that the Bamum had conquered and absorbed, in “a regional tradition of ethnic and cultural appropriation and integration"8. Beginning in the late 1890s, the kingdom experienced a surge of cultural and artistic activity, spurred by the inventive leadership of Sultan Njoya. Maneuvering between home-grown political rivals, Islamic influences from outside the kingdom, and colonial invaders from Europe, the Sultan sought to reaffirm the traditions of his people, incorporating imported ideas and technologies as well as highly creative innovations of his own. 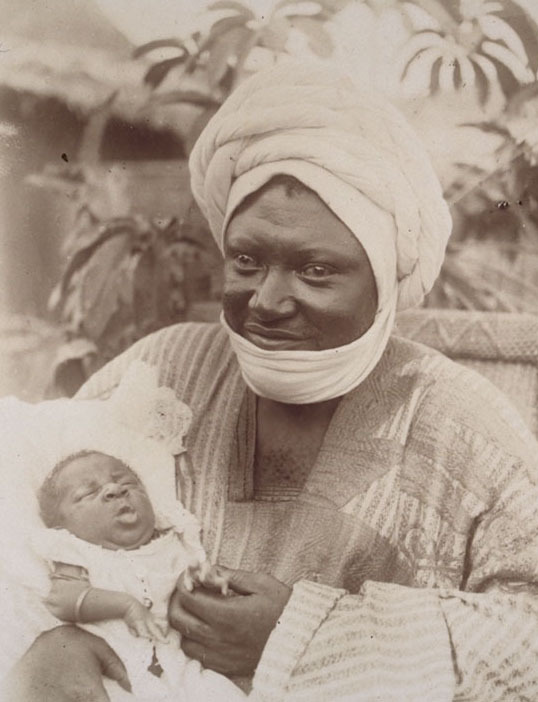 Sultan Njoya’s father, King Nsangou, had been killed in battle, sometime between 1885-89, when Njoya was a child. After a regency administered by Njoya’s mother, Njapndunke, for most of a decade, Njoya ultimately regained the throne through victory in a civil war over succession with several of his uncles. To achieve this success, the young King took the daring step of allying with Islamic Fulbe people, who lived to the north and had been enemies of the Bamum throughout the 19th Century. Impressed by their military prowess, the King converted to Islam and invited scholars to his kingdom to teach the tenets of the faith (he also acquired horses, which had given the Fulbe a major advantage). A 19th century battle between the Bumam and the Fulbe people from the north. The young King Njoya allied with these traditional enemies in order to defeat internal foes and consolidate his power over his kingdom. Undated drawing by Ibrahim Njoya. Though Europeans hadn’t yet reached the Bamum lands when Sultan Njoya took power, he was doubtless aware of their rapid colonial expansion. Anticipating such threats, and “driven by equal measures of intellectual curiosity and political necessity"9, the Sultan embarked on a series of ambitious cultural initiatives. Sultan Njoya gathered around him a number of creative young nobles to help bring his ideas into reality, most notably Nji Mama Pekekue10 (1880-1954), first cousin of the Sultan and older brother of the artist Ibrahim. 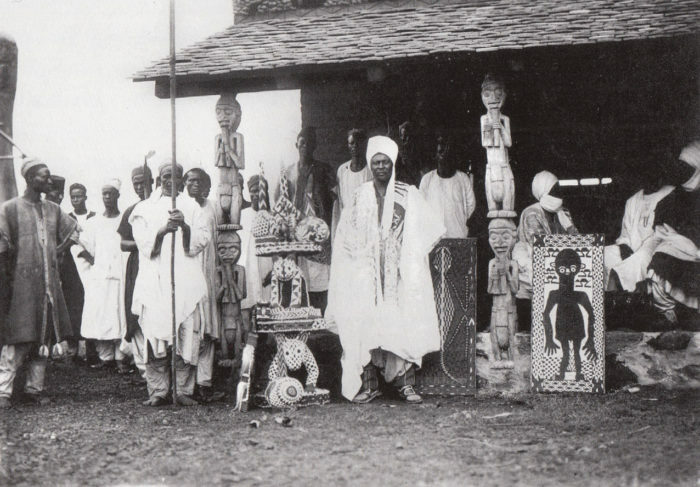 He rebuilt the royal palace, commissioning a facade made of closely-placed columns carved with figures, “trees of people” as they were called, modelled on the palaces of the nearby Bamileke people.11 In 1900, Sultan Njoya established workshops for young artists in various media, in close proximity to his palace. But the Sultan’s most famous innovation was an original system of writing, the Bamum script (sometimes referred to, perhaps incorrectly12, as the “Shü-mom script;” Shü-mom refers instead to a secret court language that the Sultan also invented!) In the mid-1890s, shortly after assuming the throne, Njoya decided - based, he said, on a dream - that his people needed a writing system of their own, distinct from the Arabic or European alphabets. He commissioned a pictographic alphabet, initially comprising as many as 1000 characters.13 This first version, completed by 1896-1897, is known as the Lewa script; one of its principle designers was Nji Mama. 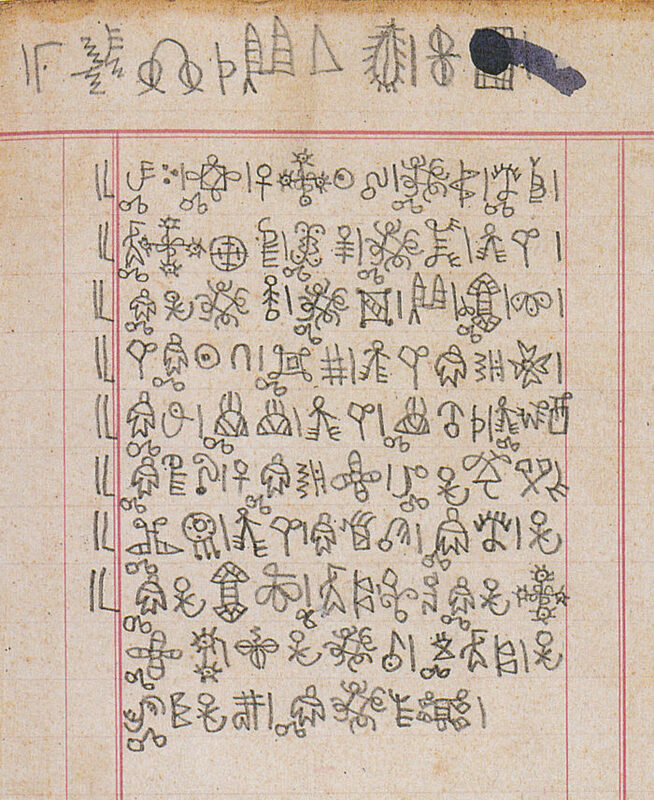 Eventually, a version of the Bamum script was used for official court documents, and for historical, medical and religious writings. Sultan Njoya would open royal schools to teach the script, as well as Bamum history. At its peak, the alphabet would have as many as 1000 literate users. 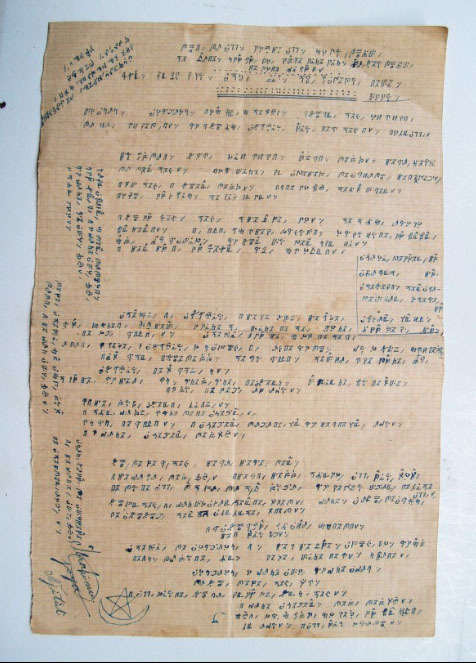 The first version of the Bamum script, known as the "Lewa" script, which was completed by 1897. This page is credited to Ibrahim Njoya (I'm not certain if this means it was written by the Sultan, or by artist Ibrahim as a schoolboy). 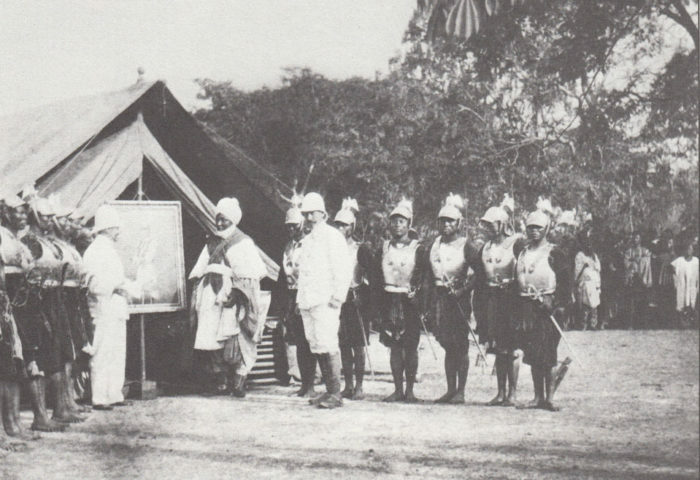 In 1902, German colonizers arrived in the Bamun Kingdom. The entire region had been claimed by Germany in the European “partition” of Africa in 1884. Resistance by neighboring peoples had proven futile, so Sultan Njoya opted for a tactical surrender, warmly welcoming the German occupiers. This strategy allowed the Sultan to maintain a high degree of autonomy in his administration of the state: he ceded military authority to the Germans, but was able to continue his ambitious cultural projects without interruption, while also seeking to modernize and reform his kingdom. The Sultan also welcomed Protestant Christian missionaries from the Basel Mission, who established a base in Foumban in 1906.15 He encouraged his nobles to enter their children in Christian schools, while still maintaining his own Bamum schools. Ibrahim attended the Protestant missionary school and was baptized in 1910 (for a time he adopted the Christianized name Johannes Yerima), though he returned to Islam in 1916.16 He translated Biblical texts into Bamum, and decorated these pages with geometrical designs.17 He also contributed original batik designs in the textile workshop that the Sultan established in the palace18. Having recognized Ibrahim’s graphic talents, the Sultan put Ibrahim in charge of a 1910 revision of the Sultan’s Bamum script. The original, pictographic version had proved unwieldy, and had been gradually reduced to 286 characters. Ibrahim’s version transformed the ideographic signs into a functional, 80-character syllabic alphabet, (also known as the a ka u ku script, after its first four characters). 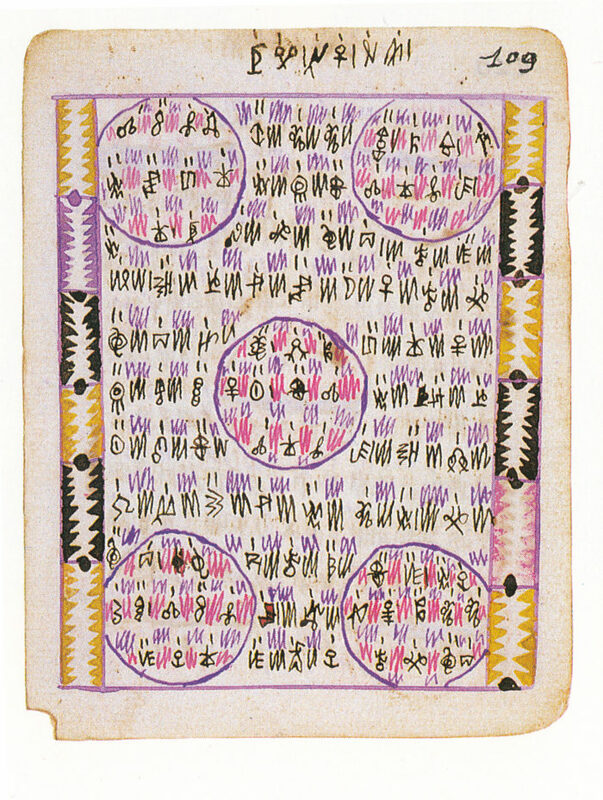 In 1916, Ibrahim designed and lettered the Sultan’s book “Nwet Kwete” (Pursue to Attain), which laid out the precepts of another ambitious project, his own syncretic religion, which blended elements of Islam, Christianity and Bamum spiritual beliefs.21 Ibrahim’s pages are strikingly composed and feature an exciting play between abstract design elements and the hand-drawn calligraphic text. Pages 51 and 52 integrate the Bamum lettering with colorful patterns, hatching and dashes. Later the layouts are even more dramatic, adding patterned borders and segmenting the page into circular panels that seem to punctuate the flow of the text (pages 109-110), or enclosing the entire text in a circle, surrounded by a segmented colored border (pages 95-96). In pages 117-118, flag-like emblems adorn the text, in the borders or incorporated into the page (118). With its blending of text with design elements, Nwet Kwete appears to be a hybrid visual/literary document, its specific layout and graphic character integral to its message. 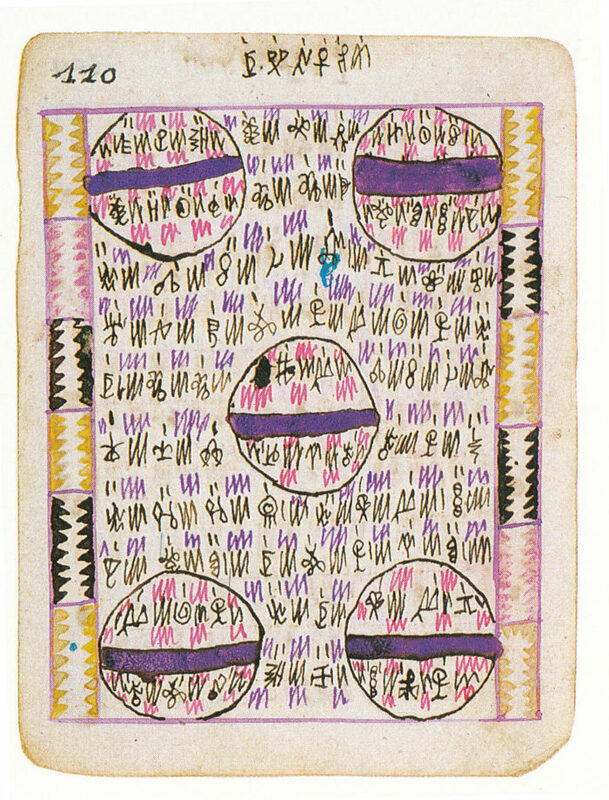 The graphic skills and techniques honed in the development of the alphabet and the creation of books like Nwet Kwete, were soon applied to representational drawing, establishing a relationship between text and image from the outset.24 The development of Bamum script thus facilitated the growth of drawing as a distinct art form, which was still quite rare in Central and Western Africa at that time.25 Ibrahim’s first figurative drawings were produced during his early years of service in the palace, though most of these early works were lost in a palace fire in 1913. 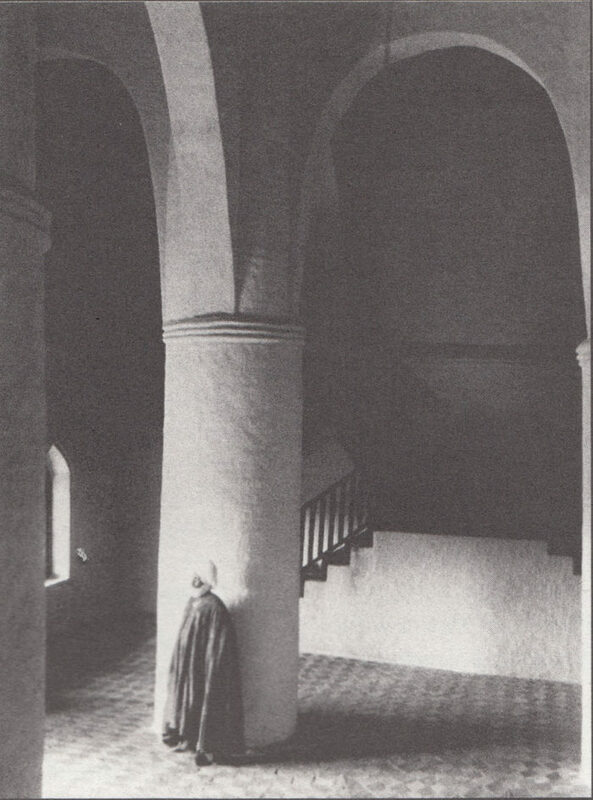 Drawing was taught at the palace school that Ibrahim directed starting in 1908. 26 The new medium resulted in other possibilities as well, including cartography.27 Nji Mama drafted the first Bamum maps, but Ibrahim would reproduce his own versions often. Bamum agricultural calendar, drawn by Ibrahim, 1911. The First World War had major consequences for the Bamum state. In 1916, as Germany’s fortunes faded, the kingdom fell under French colonial rule. Sultan Njoya’s accommodating strategy was doomed to fail against the new occupiers, as the French were much less “indirect” in their management of colonial possessions, and frowned on independent local rulers. France aggressively pursued the “Gallicization” of their colonial subjects, instilling French language and cultural values that would inevitably clash with the autonomy the Sultan had enjoyed under the Germans. This process was hastened by political conflicts within the Bamum nobility itself. 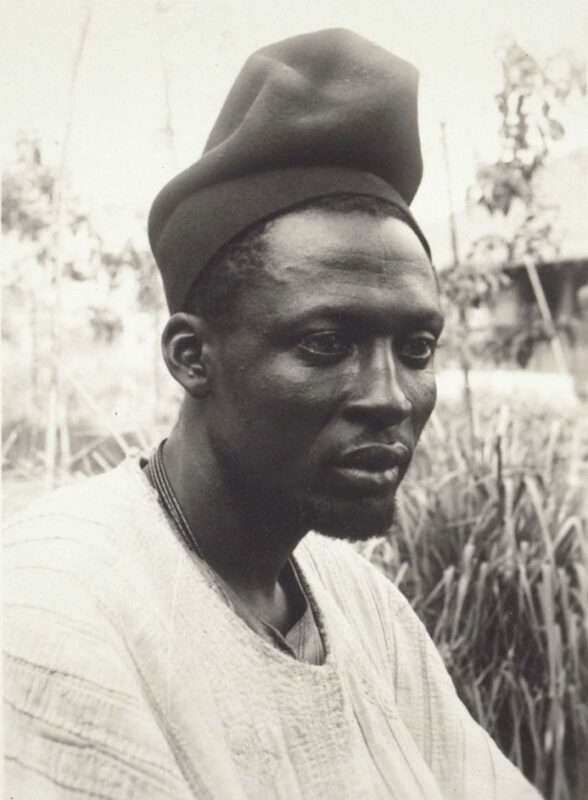 A member of a rival branch of Sultan Njoya’s family, Mosé Yeyap, who worked for the French as a translator, sought to weaken the Sultan’s position from his position within the colonial administration. Yeyap was a Christian, educated in the Basel mission school, fluent in German as well as French.28 Prior to the arrival of the French, he had served the Sultan in various capacities, but under the new colonial regime he would become a formidable antagonist to the monarch, in the realms of culture, religion and politics. Beginning in 1919, the French instituted a number of policies that disrupted the economic order supporting Sultan Njoya’s political powers and resources. These include the elimination of Bamum systems of slavery, polygamy and tribute payments. Later in that year, based on trumped-up conspiracy charges, the Sultan and several of his close associates were exiled to Campo on the Cameroonian coast. Ibrahim was among those joining the Sultan in exile,29 though here seems to have been some ambivalence in the the French authorities’ view of him. One official report described Ibrahim as one of ‘deux conseillers intimes du KING accusés d’avoir sur lui la plus mauvaise influence” ("two close advisors to the king accused of having the worst influence on him"). Elsewhere, a lighter deportation sentence was recommended for Ibrahim who could “bénéficier d'une certaine indulgence” ("be granted some leniency").30 The exile lasted a little over a year year. Sometime in the 1920s31 Mosé Yeyap opened Foumban’s first museum to display the work of Bamum artists. 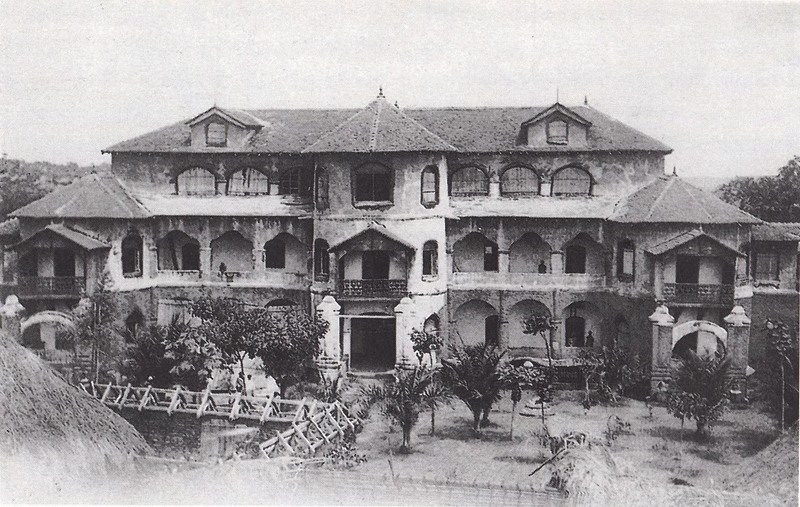 Situated at some distance from the palace, in the vicinity of the French Protestant mission, the museum included many objects from Yeyap's own collection, including some with significant connections to royal power.32 Born of the political rivalry between Yeyap and the Sultan, the new institution also reflected a transformation in the meaning of art and the role of the artist which would take place across Africa under European influence. The Sultan employed his artists and artisans to provide objects which supported, symbolized and glorified royal prestige, as well as for the secret societies which formed part of the kingdom's power structure.33. This had been the role of the arts since before the coming of the colonial powers: “things [i.e. art objects] played a major role in processes of state formation and consolidation, communicating in aesthetic terms the political charter underlying the Bamum polity.”34. Thus, two factions in a pre-existing Bamum political conflict mobilized concepts of art, economy and power into the ongoing struggle: “What the colonial administration saw as the loss of royal prestige and secularization of a sacred art, Bamun considered a political struggle. "38 The outcome, though, would be determined by the asymmetrical power of the colonial occupiers. Both museum’s still exist today: Yeyap’s would eventually become the Musée des Arts et Traditions Bamoun, and the royal palace still houses the Bamum Palace Museum. The conflict between Sultan Njoya and Mosé Yeyap came to a head in May, 1924. Recent French decisions had further diminished the Sultan's power, when a group of regional chiefs had been appointed to exercise what remained of local authority and the Sultan's income was reduced to a relatively small allowance from the colonial government, which he complained was insufficient.39 When an armed crowd of the Sultan’s supporters demanded that French authorities remove Yeyap from his official post, the administration sided with Yeyap, stripping Sultan Njoya of all governing powers outside of the palace. This essentially ended the Sultan’s reign over the Bamum kingdom. Yeyap is in many ways the “villain” of the story, complicit in bringing down the compelling figure of Sultan Njoya. But Yeyap's efforts, though no doubt motivated by political rivalry with the Sultan, might also be seen as an alternative approach to cultural adaptation and survival under colonial rule: he helped to develop a market among colonial occupiers and visitors for the artistic productions of Bamum artists, allowing the artists to make a living.41 Yeyap offered the French a victory by removing the “pagan” power of Bamum arts and rituals and transferring them to Christian, colonial terms -- removing the arts’ role in supporting traditional power structures. At the same time, though, he was integrating Bamum artisans into the new reality of the colonial capitalist economy, which could not, at the time, be defeated, and whose legacy would continue after the colonial era. During this period of conflict, Ibrahim remained loyal to the Sultan; he became the Sultan’s son-in-law, marrying his eldest daughter, Nji Mongu Ngutane.43 But Ibrahim’s own artistic career would be defined within this new paradigm of Bamum arts to which Yeyap’s efforts pointed. Ibrahim also returned to calligraphy and book design, helping the Sultan to complete a major work of history and memoir, the Sang’aam, also known as the Histoire et coutumes de Bamum. 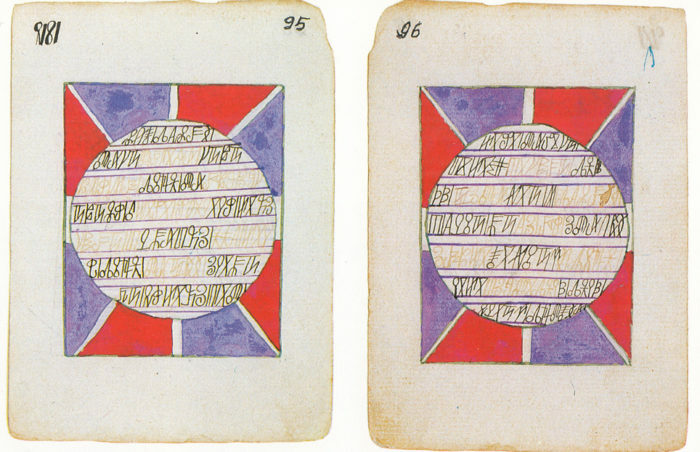 The front and back cover designs show another side of Ibrahim’s graphic talents, reminiscent of European modernist graphics of the period. Figurative elements are arranged in geometrical configurations to combine abstract design, imagery and text, intertwined in the same composition. Sultan Njoya's "Sang'aam," front and back covers, designed and drawn by Ibrahim. With the Sultan out of the picture, the French colonial authorities had no further use for Mosé Yeyap. Though Yeyap had successfully maneuvered to undermine Sultan Njoya’s royal power, he would fail in his attempts to dismantle the Bamum dynasty altogether. The French saw some benefit in keeping the traditional sovereignty intact, at least symbolically, and installed a new sultan, Njoya’s son, Seidou. Yeyap was “gradually sidelined from the affairs of the kingdom”46and ultimately removed from his position in the colonial administration, years before his own death in 1941. Sultan El Hadj Seidou Nimoluh Njoya’s power was mostly symbolic 47, but his long reign brought cultural stability to the Bamum people through the remaining decades of French occupation and well into independence. Ibrahim Njoya was the preeminent artist in the kingdom, the leading figure in a “school” of Bamum art which thrived for decades (referred to as “Njoyism” by educator and critic Natty Mark Samuels).48. In the following examination of Ibrahim Njoya's artworks, I'll try to avoid this paradigm and limit my analyses to the admittedly Western, but narrower perspective of comics form. Battle Scene from the War of Manga Ibrahim depicts the 1880s battle in which Sultan Njoya defended his throne, with the help of Fulbe cavalry, a turning point for the Bamum kingdom. Persian miniatures have been cited as a possible influence on Ibrahim's early graphic style. Battle scenes are one of his frequent subjects, as well as the so-called “kings list” drawings, which display Bamum rulers in sequenced order, often incorporating other scenes or images as separate panels. Njoya was able to execute repeated versions of these themes on commission, basing them on precise pencil sketches which served as templates.51 Ink, watercolor and colored pencils were used to finish the individual works. 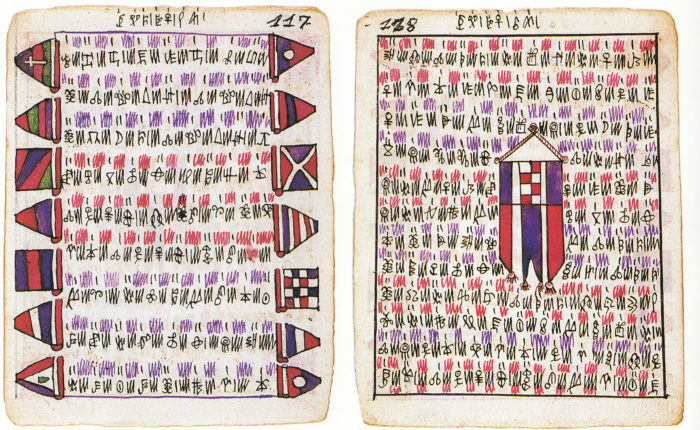 Portraits of Seventeen Bamum Kings is an early example of the "kings list" format, drawn sometime before Sultan Njoya's death in 1932. The Sultan occupies the central, largest panel, surrounded by his 17 predecessors. As well as placing him as the heir of Bamum's rulers, the page seems designed to reinforce the Sultan's authority in the secondary panels which depict the Sultan's advisors as a mounted guard, and the tree from which criminals were hung in Foumban. This king's list drawing is unusual for its lack of decorative border, perhaps due to its early date? One of the most striking elements of Ibrahim’s drawings is his use of patterning, especially within his elaborate ornamental borders. Some of these patterns are associated with Bamum royalty, probably derived from textile designs. The borders function both as ornamentation and an addition to the complexity of the artist’s narrative systems, as an “independent code of interpretation,"52 with particular patterns and animal imagery carrying specific cultural significance. The “kings list” compositions may have been partly inspired by German propaganda and memorabilia which presented portraits of Kaiser Wilhelm and his family arranged in vignettes or panels.53 But where the German versions are stiff and formal, Ibrahim creates dynamic interaction between lively portraits of the kings, their heads inclined at diverse angles, gazes leading in different directions; we half-expect these former monarchs to start debating each other over whose reign was greatest. In Portraits des 18 rois bamum Bataille de Manga contre Gbèntkom Ndombuo [Portraits of 18 Bamum kings / Battle of Manga against Gbèntkom Ndombuo](c. 1938-1940) Njoya combines a king’s list page and a battle scene into one multi-panel work that incorporates numerous visual systems into a complex narrative of history, genealogy, daily life, animal mythology and symbolic patterns. The king’s list page, on the left, vibrates with patterns and images: the 18 portraits are both sequential and hierarchically scaled, with Sultan Seidou in the center, largest panel. Four additional panels on either side of Seidou depict activities such as farming, hunting and dancing. Below, a fifth panel presents Sultan Njoya teaching the Bamum script. The border contains decorative patterning punctuated by repeated panels of two significant animal images: the two-headed snake, a symbol of the Bamum kingdom, and a spider, symbol of wisdom and of connection to the spirit world. The right hand page features a panoramic drawing of the battle of Manga. Unlike in the earlier depiction of the same event, Ibrahim has now begun to make use of perspective, with the figures in the background smaller than those in the front. We see in the top center of the page the Fulani cavalry that was key to this important military victory. Sultan Njoya, on horseback as well, slays one of his enemies in the lower center of the page. The border around the battle scene is particularly complex, made up of individual panels depicting traditional activities and, along the bottom, animals. Small central text boxes are contained in the lower border as well, on both pages. By combining the two themes, the "kings list" and the battle scene, Ibrahim creates a historical narrative without fixed reading order. As our gaze moves back and forth between them, the battle on the right (in which the young Sultan defeated his father's enemies to affirm his right to the throne) has an implied chronological place in the sequence of kings on the left: in the “gutter” between the panels of Sultan Njoya’s father and the Sultan himself. But the battle image also underpins the entire narrative of the "kings list" page, since it depicts the victory that sustained the dynasty. Woven around and through the dominant images of Great Men and martial spectacle, the smaller scenes of activities and animal imagery remind of the daily life of the kingdom. Portraits des 18 rois bamum Bataille de Manga contre Gbèntkom Ndombuo (c. 1938-1940) DETAIL: Sultan Njoya teaching the Bamum script to members of his court. In a different genre, Ibrahim created several works that explicitly "catalog" different aspects of Bamum culture. Several of these works are in the collection of the Ethnographic Museum of Geneva, to which they were donated by Jean Rusillon, a missionary formerly stationed in Foumban. 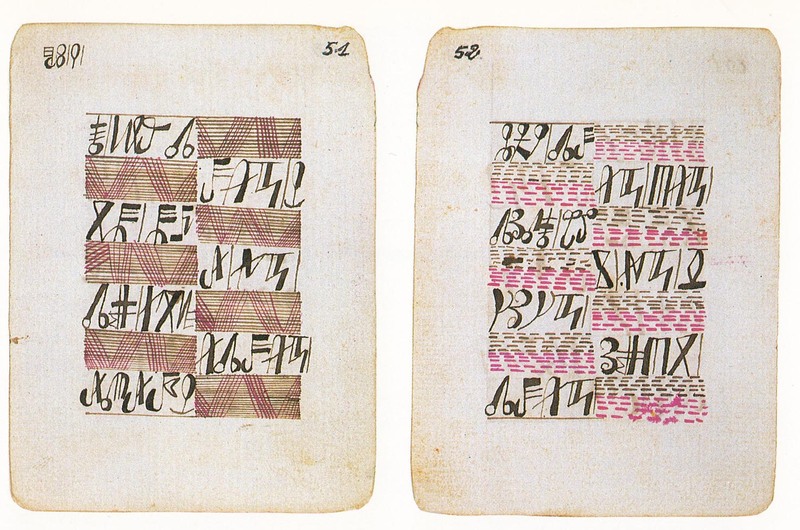 Rusillon acquired the pages between 1929 and 1932, which is thought to be the period in which they were created. These pieces aren't signed, but they are confidently attributed to Ibrahim by Claude Savary of the Geneva Musuem, among others. Planche des objets [Page of Objects] is one of Njoya’s most celebrated pages: a ten-panel composition of inanimate objects linked to Bamum rituals and royalty. 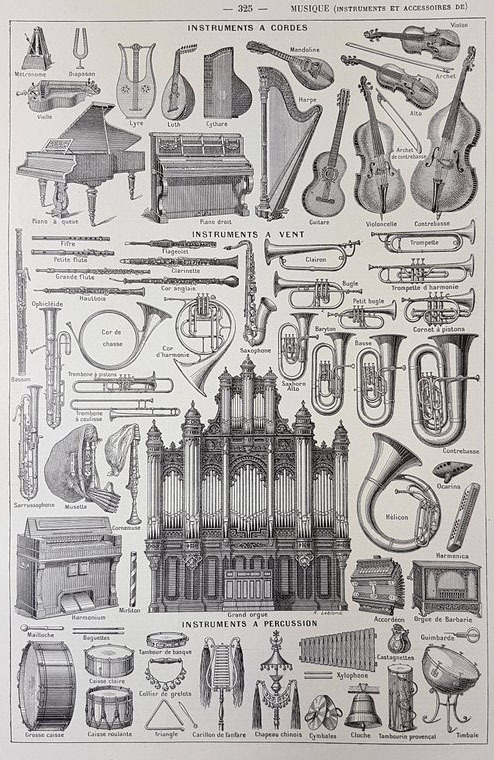 Superficially, it bears some resemblance to European encyclopedic illustrations, but, as with the "kings list" pieces, Njoya infuses this “catalog” image with life, through his use of diagonals, patterns and varied distribution of objects across the page, as well as soft, warm coloring. The cultural narrative contained in this presentation of "things" operates on multiple levels. The objects depicted were those housed in the royal palace -- and subsequently the palace museum -- and thus have political historical, and even sacred significance. The Planche des motifs décoratifs [Page of decorative motifs] is another in this “cultural catalog” genre, in this instance a thirty-panel grid of patterns and stylized animal imageries used in Bamum textiles, sculpture and bead work. Beyond their decorative function, these designs, most of them based on animal references, carry specific cultural meanings with regard to social ranks, royal power, religion, etc. Text boxes beneath each panel identify the pattern, its meaning and usage.57 Like many of Ibrahim’s other multi-image pieces, this composition of abstract patterns serves as a documentation of Bamum tradition; in this case, it’s also a sort of meta-artwork, a pattern of patterns, a picture (or comic) about pictures. In a two-panel narrative drawing, Njoya presents two dramatic moments of Bamum domestic life: in the first panel, a woman gives birth to a baby, and in the second, the mother looks on lovingly as her son is circumcised. Without text, this is a pure visual narrative, bustling with activity. Strong diagonal shapes and compelling expressions lead the viewer’s eye back and forth across the gutter. A central diagonal runs from the newborn baby in panel one, to the mother’s face in panel two, focusing us on the interaction between mother and child in the second scene, as much as on the action of the circumcision. This simple line drawing may be a sketch used by Njoya to recreate the sequence for commissions or for a carved frieze; no finished versions have been reproduced, as far as I know. Reproduced in Claude Tardit's L'Histoire singulaire de l'art bamoun, the drawing's dimensions and media are not indicated. When Ibrahim turned to adaptations of Bamum fables and history, his technique most closely approximated that of Western comics. Three of these, The Tale of the Leopard and the Civet, The Tale of the Frog and the Kite and The Tale of Mofuka and the Lion are held at the Ethnographic Museum in Geneva. Vertical pages, featuring sequential narrative panels within decorative compositions, the fables are softly colored in colored pencil, with black and white inked borders. In each, five and four image panels, respectively, are arranged around a large central text panel, and surrounded by geometrically decorated borders, which also feature small panels of animal heads at the corners and mid-points. In the border of The Frog and the Kite a regular geometrical pattern weaves around images of cowrie shells (which were used as currency in many pre-colonized African societies); Mofuka and the Lion’s border contains six different patterns separated by punctuating cow-head panels. Text is also present within the pictorial panels: small captions at the bottom of each panel in Mofuka and the Lion, and, in The Tale of the Frog and the Kite, multiple text boxes within each panel that suggest the possibility of “word balloons,” though without access to a translation we can’t be sure. Also intriguing is the notations (“a,” “b,” “c,” etc.) assigned to characters in Mofuka and the Lion, an unusual type of image-text narrative device. 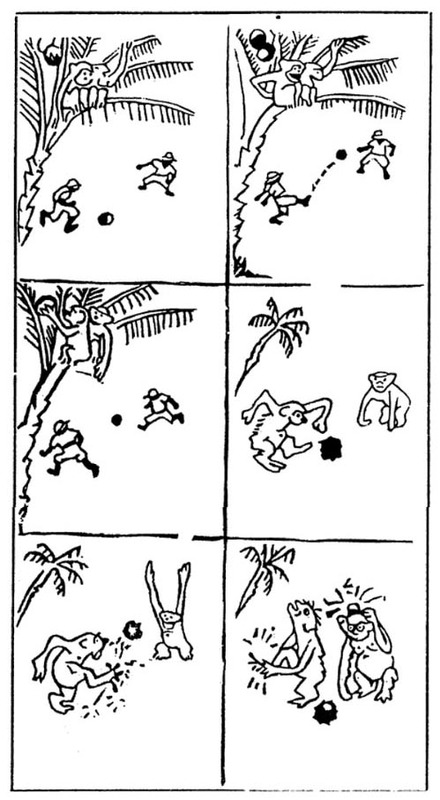 The little rat, protagonist of the story, is not visible in the last seven drawn panels, but is nonetheless a strong presence, “seen” in its effect on the human characters, an unusual and “comics-specific” bit of visual storytelling. The text of the fable is presented in vertical captions on the left side of each panel. The format of explanatory text-boxes accompanying each panel was the norm in European comics through the 1920s; whether Njoya had seen such comics is unknown, but his placement of the text panels is an interesting variation, one which has a definite effect on the reading pattern: the text precedes the image in left-right order, so the viewing eye is not required to move up and down in each panel between picture and text, but can move along the horizontal tiers in a continuous left-right motion. The text panels create vertical bars running from the top to the bottom of the page, a striking effect, at least to an eye accustomed to horizontally placed captions. This is the most elaborate of Njoya’s sequential narratives, with numerous characters and scenes, and his narrative breakdown shows a comfortable mastery of the form. In terms of panel transitions, the first two panels show the baby rat falling behind its family, and then, in a different scene, being helped across a river by a passing trader. Panel three is the only instance of “cross-cutting” in the story, as Njoya “cuts back” to the mother rat and remaining children continuing on without the runt, across the river and out of the narrative for good. From here, the tale progresses linearly, mostly scene-to-scene, to use Scott McCloud’s terminology, for the baby rat’s various encounters. The pacing of the story slows for three two-panel sequences that show actions in the same location (panels 5-6, 8-9, 13-14). Njoya again used a horizontal grid format (three-by-three, nine panels) for a chronicle of ancient (and probably mythical) Bamum history, the people’s migration from Syria and Egypt. Dating to sometime after the end of World War II,62 this piece raises many questions. The version that is reproduced is a partially-inked pencil drawing, perhaps either an unfinished project, or a template for finished works. Unlike in virtually all of Njoya’s finished drawings, there is no border. Text beneath each image is written in French and the panels are numbered in Western style; the narration under the first panel exceeds the space seemingly alloted for it. There are also penciled notations in Bamum script, in what are either wide gutters, or additional, vertical text-boxes as in the rat fable. Was Njoya planning, or did he complete, versions in both Bamum and French, perhaps for commission? Does the story finish in panel nine, or were more pages planned? Hopefully the answers to these questions are out there, and will come to light! In a carved table from 1946-47, we see that Ibrahim employed the format developed in his drawings, of juxtaposed narrative images. The table’s imagery is arranged in three horizontal tiers: scenes of traditional Bamum culture -- hunting, dance, battle -- with portraits of major rulers at the corners (Sultan Njoya at lower left) and then-current Sultan Seidou in the center. Within the three tiers of the image, panel shapes are carved into the wood, though compared to the grid-based drawings, the space is more abstracted and continuous. But what kind of a person was Ibrahim Njoya? While Sultan Njoya left behind a memoir, to go with numerous descriptions and evaluations of him by colonial officials, the inner life and personality of Ibrahim the artist are far less accessible to research from a Western perspective. There are no published writings. Several letters between Ibrahim and his brother Nji Mama are in the collection of the British Library, but they are written in Bamum script, still untranslated -- though efforts are currently underway in Foumban to revive and teach the Sultan’s alphabet. Ibrahim seems to have been a devout Muslim (one letter is summarized as “regarding the reason why the name of Allah should be evoked at both the beginning and the end of any social event” ),68 but besides a few such tantalizing clues, from our vantage point, the character of Ibrahim Njoya remains mostly a mystery. Cameroonian writer Patrice Nganang’s evocative novel Mount Pleasant, about the last years of Sultan Njoya’s life, contains a brief, vivid description of Ibrahim, as seen through the eyes of his lover and future wife, the Sultan’s daughter, Nji Mongu Ngutane , a major character in the book. Looking at the elegant photographs of the artist as a young man, I like to believe that this fictional imagining brings at least an aspect of Ibrahim Njoya, the person, to life. The arrival of Ibrahim, Nji Mama’s younger brother, shifted Njoya’s perimeter somewhat. Although not part of the princely nobility... that man had, as he put it, abandoned the plebes and their foolishness. In short, that man, who broadcast his aristocracy through the tilt of his hat and catlike eyes, infused new life into Ngutane’s veins. It seemed that she chose her wardrobe just to garner one of his winks. … The dance had returned to her step, just as when she was in her glory, back in Foumban. If until then she had found no partner who could keep up with her, in Ibrahim she suddenly had a man whose sense of style revealed a vanity beyond compare.69. All scans of Ibrahim Njoya artwork are from Les dessins Bamum, Musée d’Arts Africaine, Océaniens, Amérindiens, Marseilles, 1997, unless otherwise noted. Morin, Floriane, “The MEG Collection of the Precursors of African Pictorial Art,” in Leclair, Madeleine, Morin Floriane, Tamarozzi, Federica (eds). 2014. The Collections in Focus. Musée d'ethnographie de Genève. Exhibition catalogue. Genève: MEG / Morges: Glénat, 256 pages. Ibrahim Njoya: 'The Mother Rat and her Children', translated by Nji Oumarou Nchare, Konrad Tuchscherer and Amy Reid, in: Pulsations: The Journal of New African Writing. The Red Sea Press, Trenton, New Jersey, 2012, pp. 127-139. The number usually cited for the first version of Bamum script is 510, see Njoya, Rabiatou, Les dessins Bamum. Kenneth J. Orosz puts the number at over 1000. See page 6, Orosz, Kenneth J., Njoya’s Alphabet: The Sultan of Bamum and French Colonial Reactions to the A ka u ku Script, Cahier d’études Africaines, No 217, 2015. In Le Royaume Bamum, (ms. p 51) Historian of the Bamum kingdom Claude Tardits says that there were two versions of Nwet Kwete commissioned by Sultan Njoya, in different versions of the Bamum writing system, one in 1916, another, incomplete, in 1922. I’m not sure which version these pages, and the ones below, are from. They are reproduced, undated, in Le Dessins Bamum. Tardits, Claude., Le Royaume Bamoum, A. Colin, Paris 1980 p. 933 The report written in Douala by the colonial Battalion Chief Martin on Dec 27 1919. Simon Dell dates the opening of Yeyap's museum to 1920 in “Yeyap’s Resources: Representation and the Arts of the Bamum in Cameroon and France, 1902-1935" on the other hand, Alexandra Galitzine-Loumpet asserts in "Reconsidering Patrimonialization in the Bamum Kingdom" that there is no contemporary record of a formal museum opening before 1929. Tardits, Claude., Le Royaume Bamoum, A. Colin, Paris 1980, p 86 The notion of Syrian/Egyptian origins of Bamum people were attributed by Tardit to the Bamum Academy established in 1944, suggesting a date not prior to that for Njoya’s comic. Wonderful article. Too long to read at work so I printed it out and read it on the train ride home. I really enjoyed the extra detail on the life of Ibrahim Njoya’s cousin, Sultan Ibrahim Njoya, whom I first encountered in “Afrikan Alphabets” by Saki Mafundikwa. This is an incredible article. Superlative work, Dan. Also fantastic reading list too, much appreciated!